Viridian Green Laser Sights (VGLS) X5L, X5L-R, C5L, C5L-R and Reactor/R5 Tactical Aiming Laser Sight (Green and Red Laser)/Tactical White Light Modules for Combat/Tactical Pistols (Video!) | DefenseReview.com (DR): An online tactical technology and military defense technology magazine with particular focus on the latest and greatest tactical firearms news (tactical gun news), tactical gear news and tactical shooting news. 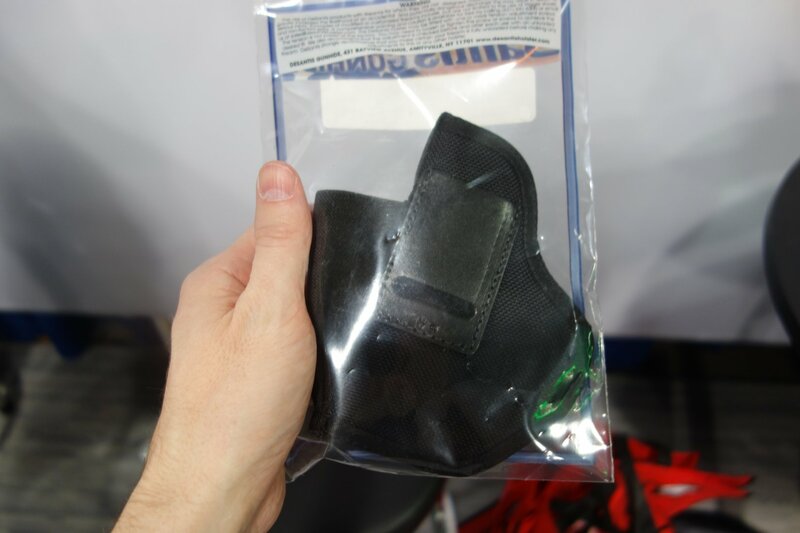 While we’re on the subject of weapon-mounted laser aiming devices, the good folks at Viridian Green Laser Sights (VGLS) had a lot of very cool new pistol laser sight/tactical white light modules at SHOT Show 2014, and company rep Joe Houser was kind enough to take DefenseReview (DR) through a bunch of them. Specifically, he took us through the Viridian X5L, Viridian X5L-R (Elite Red), Viridian C5L, Viridian C5L-R (Elite Red), which all mount on the pistol’s MIL-STD-1913 “Picatinny” rail, and the trigger guard-mounted Viridian Reactor/R5 Laser Sight and Viridian Reactor/R5 Tactical Light. Unlike the X5 and C5, the Reactor/R5 isn’t a combo unit, so it’s an either/or proposition. 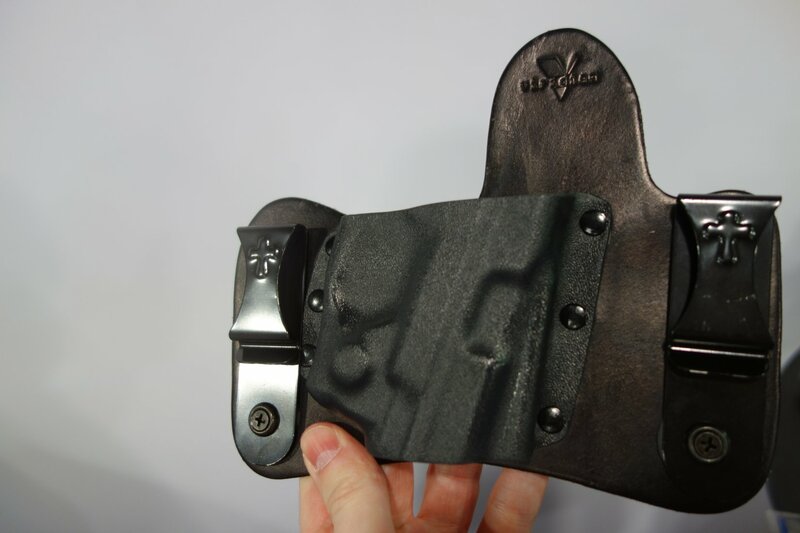 While the Viridian X5L and X5L-R are designed for use on full-sized and compact tactical pistols, the Viridian C5L and C5L-R are designed for use on compact and sub-compact tactical pistols. 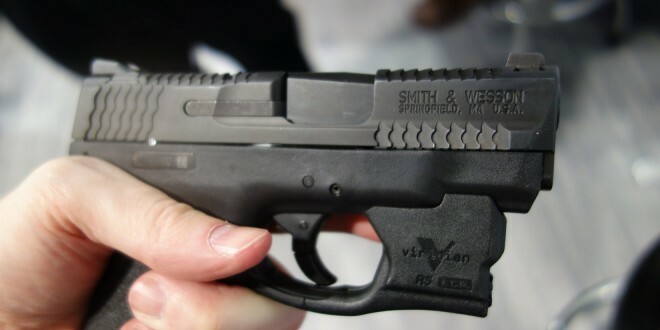 The Viridian Reactor/R5 Series was developed specifically for sub-compact pistols like the Ruger LCP, Ruger LC9 and Smith & Wesson (S&W) M&P Shield. All the Viridian laser sights are ambidextrous with activation buttons on both sides. 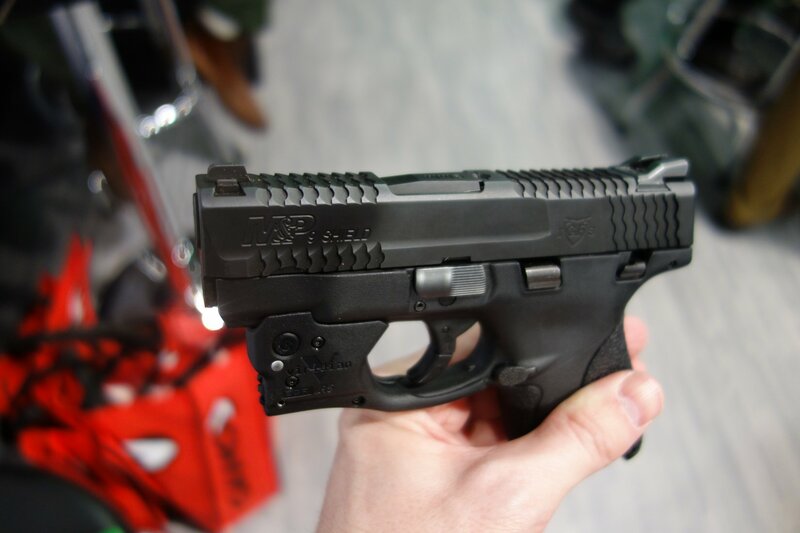 Houser told DR that he prefers the larger Viridian X Series for a compact pistol like the Glock 19 (or S&W M&P Compact, we assume), for the extra power and battery life, even though the X5 will stick out a bit further than the muzzle, which Houser says isn’t a problem. 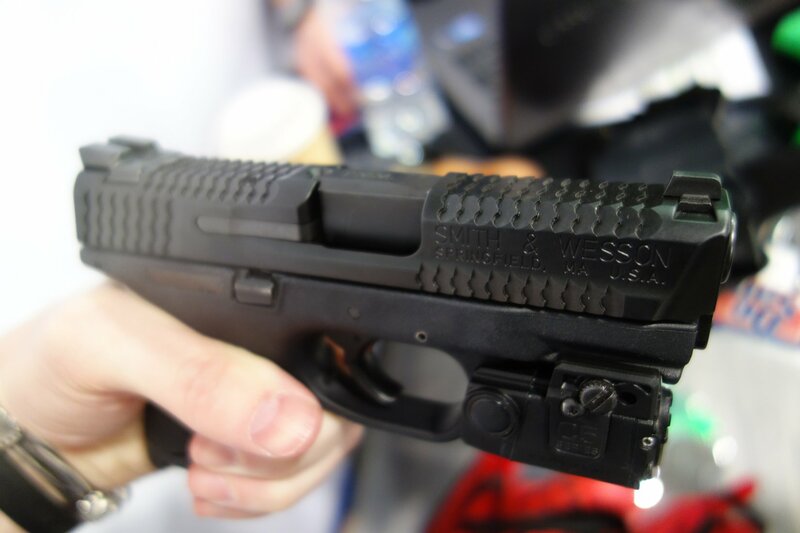 For sub-compact pistols, the Viridian C Series or Viridian Reactor R5 (laser sight or tactical light) is the way to go. 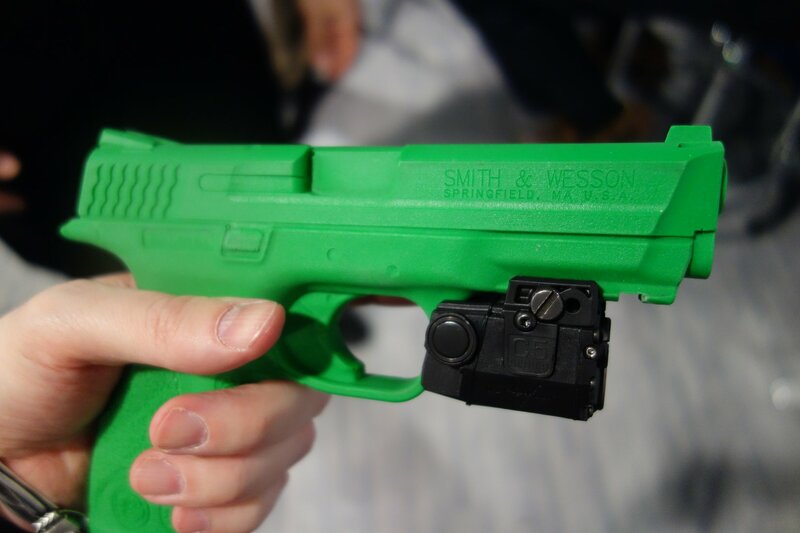 Here’s how the Viridian X5 and C5 laser sight/tactical light modules work: You can activate the ambidextrous, instantly-activated constant-on laser sight and/or tactical light with either your support hand thumb or primary hand index finger. 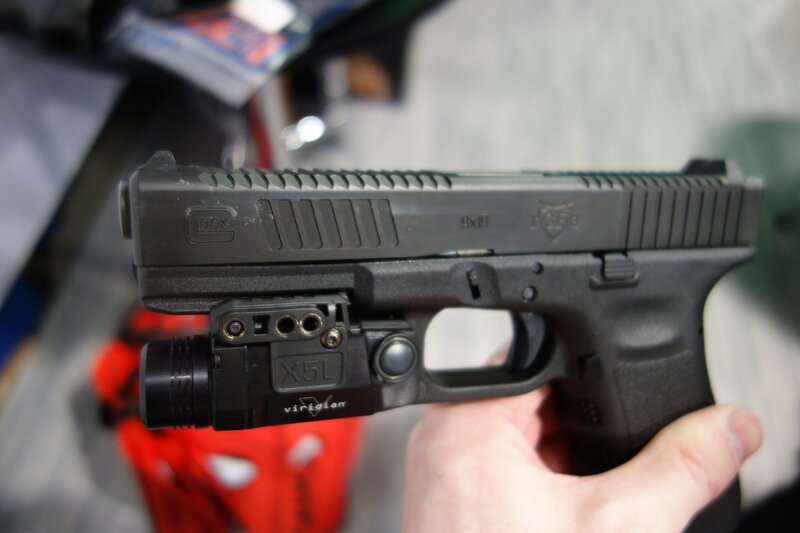 Just press both activation buttons simultaneously to switch between the various modes: laser sight, tactical light, laser AND light, strobe laser, strobe light, and strobe light and laser. There’s also a radiance wide-beam light mode, which you can strobe by itself or with the laser just like the standard round light beam. One of the most important aspects of the Viridian Green Laser Sights laser sight/tactical white light modules are their strobe capability. The light’s strobe capability is the most important tactically, i.e., in terms of dynamic CQB/CQC (Close Quarters Battle/Close Quarters Combat) gunfighting, since the strobing light can disorient/discombobulate an attacker, and thus aid in neutralizing him. The laser’s strobe capability is less important, but can enhance fast identification in daytime conditions, AND it can enhance the intimidation factor. It can also potentially enable two shooters to discern between their respective lasers in multi-shooter scenarios. Editor’s Note: People tend to focus on the laser’s ability to aid night shooting, but the intimidation factor shouldn’t be overlooked. 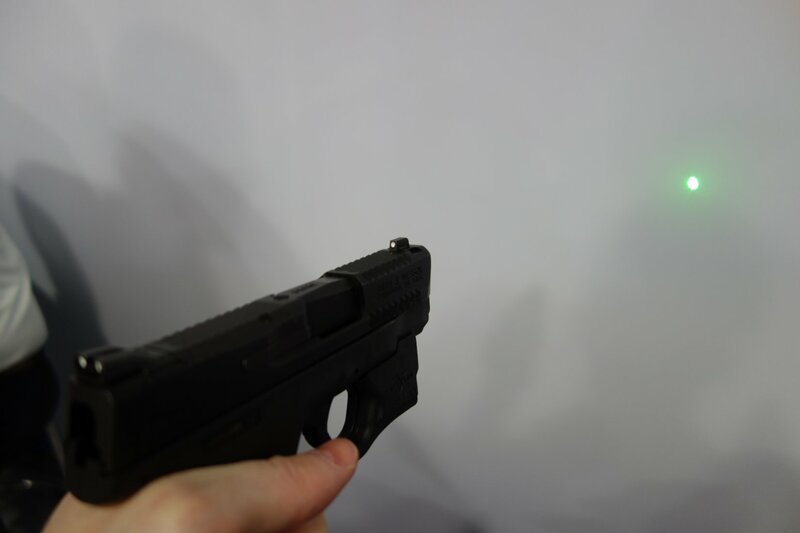 A laser dot on a bad guy’s chest can in some cases deter or stop the attack and negate the need to shoot him. This is a good thing, as shooting an attacker should always be the very last resort in the self-defense continuum, and should only be done if/when there is no other way to prevent or stop the attack. It’s the very last option. So, if you can scare an attacker off with a laser dot on his chest, fantastic. Defensive shooting (and potentially killing) averted. Everybody wins, because everyone lives, and no life is taken. 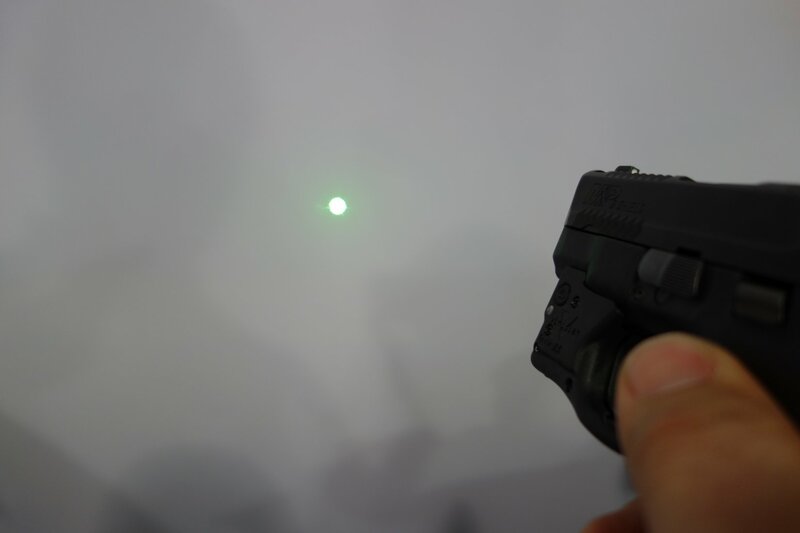 Viridian’s green laser sight is billed as the brightest laser sight in the industry. The significantly less expensive “Elite Red” models, the aforementioned X5L-R and C5L-R, sport a signficantly less power-hungry red laser, so the laser will have a significantly longer battery life. You’ll get “30+ hours constant laser, 45+ hours pulsing laser 90 minutes laser/light” versus “6+ hours of constant laser runtime, 10+ hours of pulsing laser runtime, 60 minutes of laser and light runtime” in the X5L series. In the C5L series, you’ll get “20+ hours constant laser 35+ hours pulsing laser 75 minutes laser/light” versus “4+ hours laser (constant), 7+ hours (pulsing), 1+ hour (tac light and laser)”. In the Reactor series, the Elite Red model will give you “6+ hours constant laser 12+ hours pulsing laser (depending on use)” versus “approximately 1 hour (depending on use)”. So, the green laser may shine brighter, but the red laser shines longer. The Viridian Elite Red laser is also billed as the brightest red laser in the industry. The Viridian X5L, Viridian C5L and Viridian Reactor/R5 Series laser sights are now available with Viridian’s proprietary Enhanced Combat Readiness (ECR) instant-on/off feature when combined with an ECR holster. 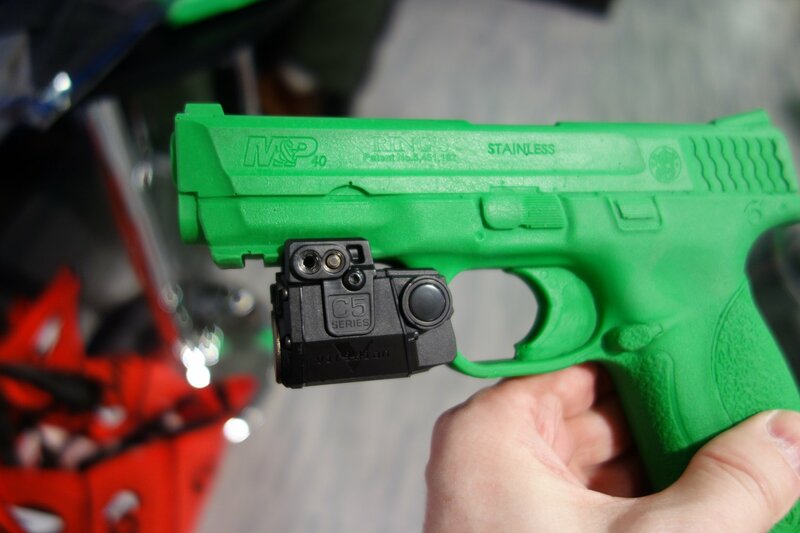 The Viridian ECR instant-on/off employs special ECR magnet-outfitted holsters to automatically turn the laser off via a magnet in the Viridian laser sight/light module and corresponding magnet in the holster. 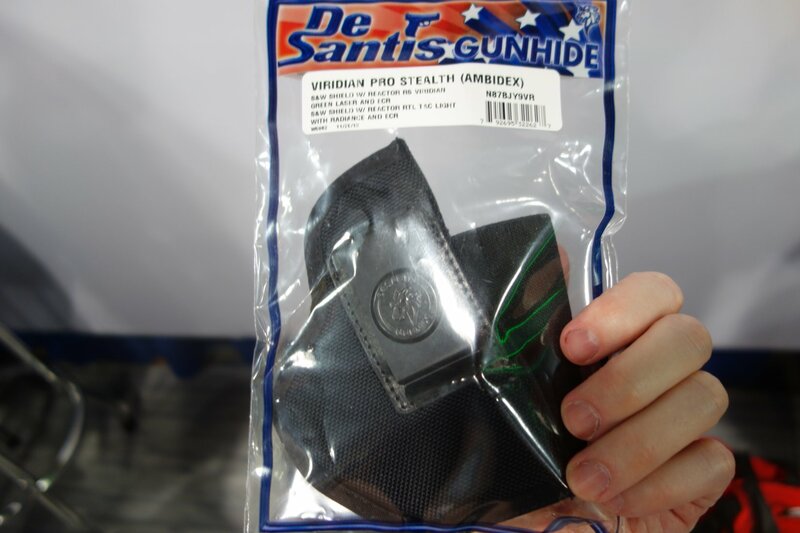 The pistol is holstered with the sight activated. 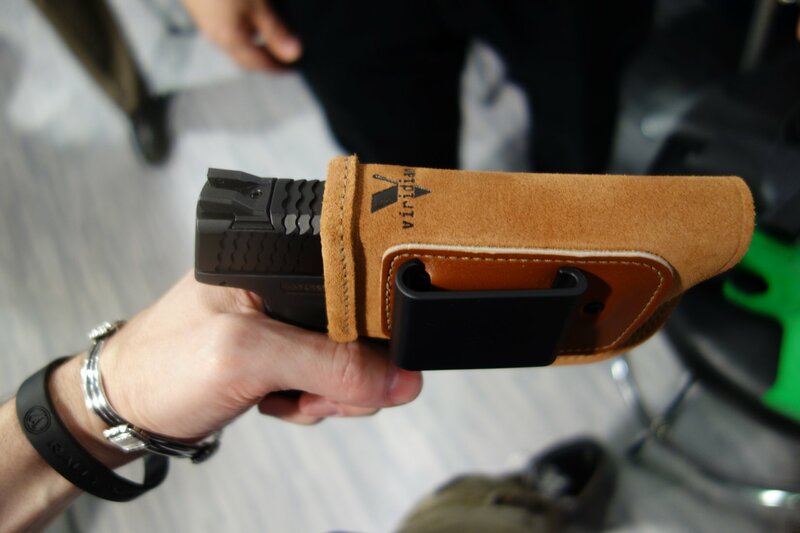 Since the holster automatically shuts the laser off, it will automatically go back on when you draw the weapon. Watch the second/bottom embedded video to see it working. 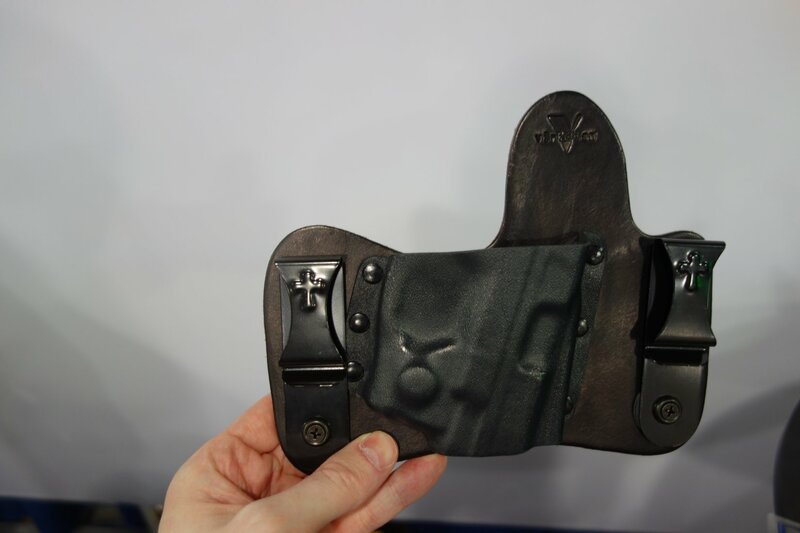 The ECR holsters Defense Review was shown were a Galco Gunleather IWB holster and either a Crossbreed SuperTuck Deluxe or Crossbreed MiniTuck IWB (Inside The Waistband) holster for the S&W M&P Shield sub-compact pistol, but DeSantis Gunhide also makes ECR holsters. The Viridian ECR instant-on feature is magnetic/electronic. 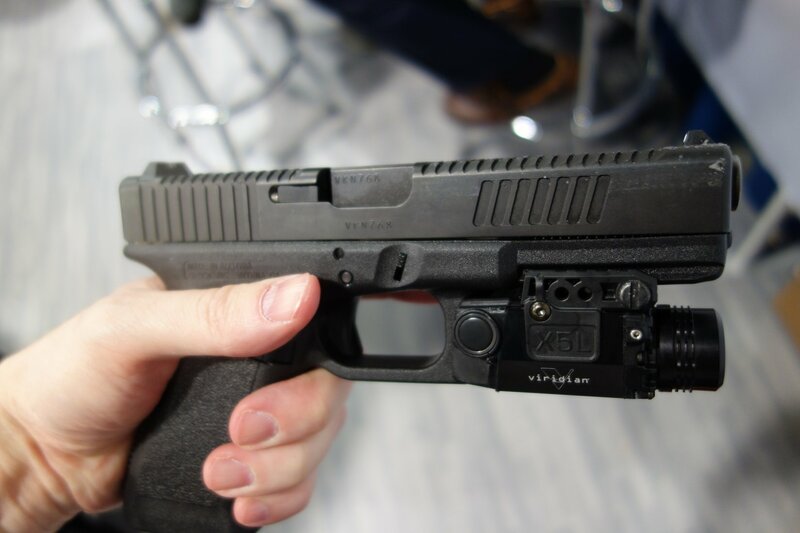 It’s interesting, but experienced tactical shooters will most likely want to manually control their laser sight’s activation and deactivation. 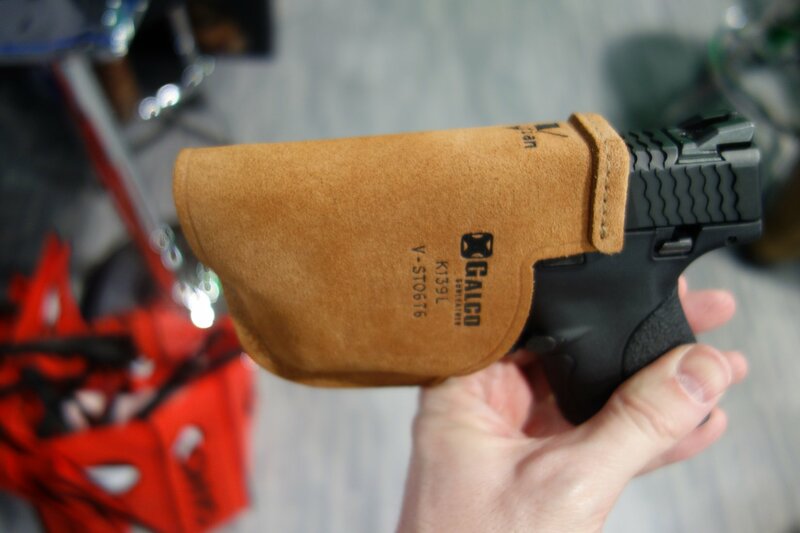 We should also mention the customized Glock 17 (G17) 9mm tactical pistol and S&W Shield sub-compact tactical pistol that sported some excellent conventional and M&P-matching scalar/scalloped front and rear cocking serrations/decoration on the slide provided by Innovative GunFighter Solutions (IGFS). They do nice work. DR recommends that you watch the embedded videos below to see the various Viridian laser sight/light models being demo’d for us.